Plan an unforgettable day ! 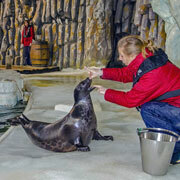 An unmissable experience discovering the work of the keepers at Océanopolis ! a major French aquarium in Finistère, Brittany. Find us in Brest, west of Saint-Malo and the Golfe du Morbihan. Plan your visit with your children, check out our different rates and buy your tickets now to dive into the aquatic world of the oceans. Our leisure park recreates the marine ecosystem in around fifty aquariums and hosts many species of fish, including the main, 1 million-litre shark aquarium. We also offer the opportunity for professionals to organise their seminars in our Brittany park. See you very soon!